Possibly the most exotic and beautiful of all the genera of tarantulas, in my opinion, is Poecilotheria. These large, graceful, lightning-fast arboreal tarantulas originate from India and Sri Lanka and are known for their lithe, athletic builds and amazingly striking patterns and colorations that make them experts at camouflage. My female P. vittata (upper right) using it’s amazing camouflage to blend in with it’s surroundings in the classic pokie pose. Although quite beautiful and striking, Poecilotheria possess a combination of speed and a higher venom potency (per bite reports) that make them more of an advanced species (or one for the the cautious and aware keeper). It has been said that the the speed of a Pokie, as enthusiasts amicably refer to them, must be experienced to be truly appreciated. A keeper used to working with slower species might find himself ill-prepared to deal with a 9+” spider that can be out of its cage and on your arm faster than you can blink. Still, those experienced in keeping these amazing creatures adore them for their beauty and elegance, and argue that, for the experienced keeper, they are a most rewarding animal to keep. The majority of the species in this group can be described as more secretive and skittish than aggressive, and many will resort to sitting still and using their natural camouflage to hide them as a first line of defense. A keeper who is aware of his animal, its habits, and its location, and who avoids spooking it, will likely have little problems. When selecting my first pokie, I hit the message boards, reading first hand accounts from those who had successful kept Poecilotheria for years. As this was going to be my first pokie, I specifically wanted one of the species known for being “calmer” and less prone to be defensive. P. regalis and P. vittata were both mentioned repeated as good beginner pokies, so I kept my eyes open. When Ken the Bug Guy offered a 3″ female P. vittata on his site, I jumped at it. When she arrived, I was pleasantly surprised to discover her to be a full 5″ (Ken often gives his customers a bit of a size upgrade). 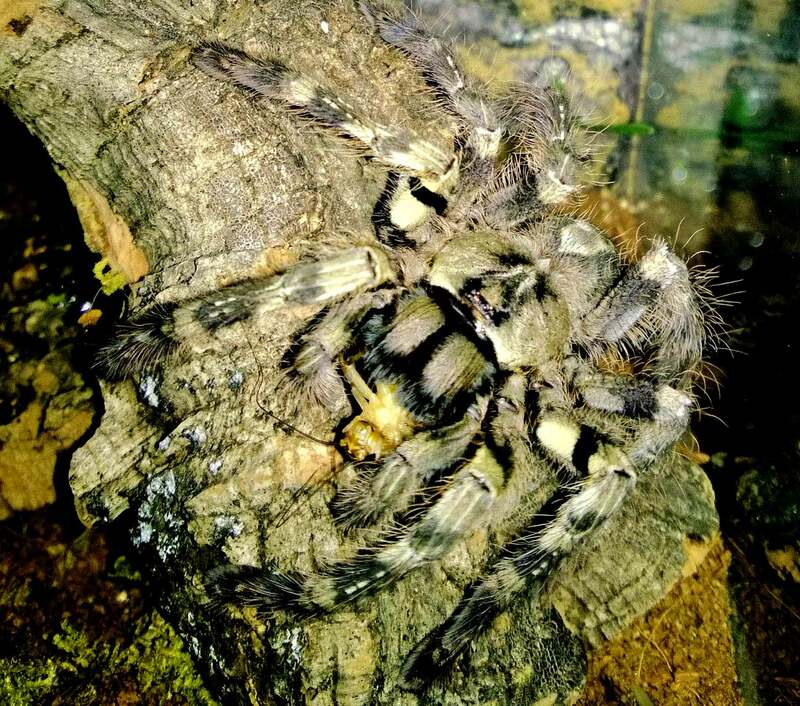 As I wanted this T to be one of my display tarantulas, I purchased an 8″x8″x12″ Exo Terra Nano for her, along a water dish, a cork bark slab, and Flukers bendable vines to create some more hiding areas. I arranged the tank in such a way to give her several places to hide and to feel secure. Although I keep the substrate mostly dry, I overflow the water dish a bit each time I water her, and let it dry out in between. Because the screen top of the Exo Terra provides a bit too much ventilation, and doesn’t allow for me to maintain a higher humidity during the winter, I will block the front three quarters of it off with plastic during the colder months when my home’s heat dries out the air. 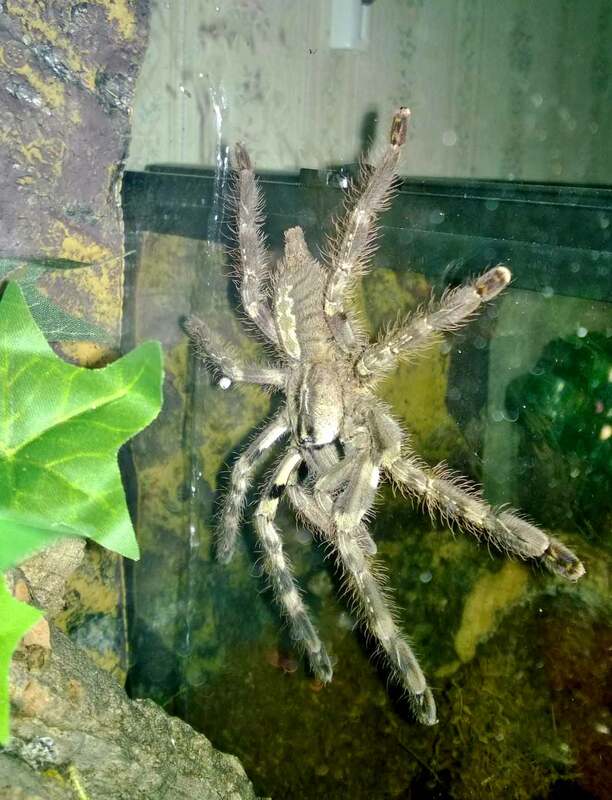 The evaporation of water from the wide water dish keeps the air properly humidified without the need to spray and unnecessarily disturb the T.
My P. vittata hanging out on the side of her enclosure after a meal. My P. vittata is an excellent eater, and I always get a thrill when I see her perk up from wherever she is hiding after sensing a prey item nearby. Often when she hunts, I get glimpses of her blinding speed as she pounces for the kill. Besides keeping the humidity in her enclosure a bit higher than I do for many of my other Ts, I also have to do a bit more maintenance than usual. As arboreals often do, my vittata frequently shoots her feces around the enclosure, hitting the glass and producing some rather unsightly white drips and spatters. These can be carefully cleaned off with wet paper towels (no cleaner). My P. vittata settling down to enjoy a fat cricket. Before cleaning or feeding, I will tap the enclosure a couple times to “warn” her that I am coming. This will cause her to hide and hunker down wherever she is at, allowing me to carefully open the cage to drop in a cricket or to clean. If she is at the front door when I want to open up, I wait until she is in a more safe location at the back of the tank. My P. vittata quickly became one of my favorite Ts. She is just gorgeous to look at, and spends much of her time out in the open for us to admire. When she does hide, my family and I enjoy trying to see how quickly we can pick her out of her surroundings. I am very much looking forward to her next molt and watching as she develops her striking adult coloration. 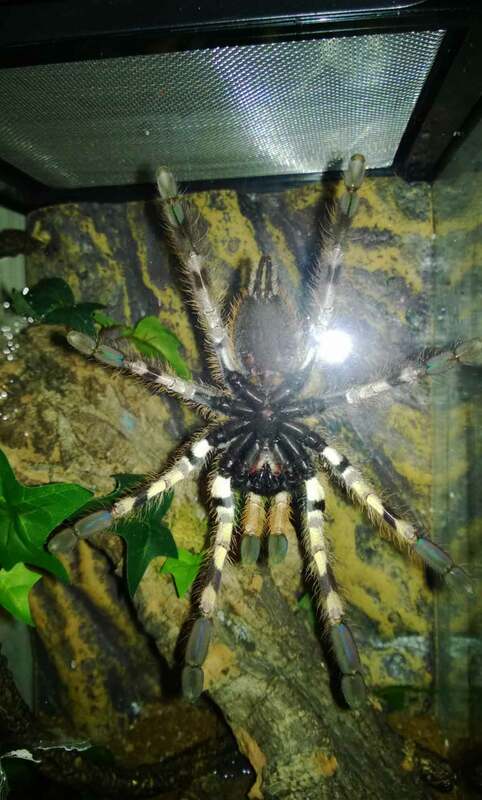 At a max size of 7+ inches, she is sure to grown into a beautiful showcase tarantula. A ventral shot of my P. vittata spread out on her enclosure door. 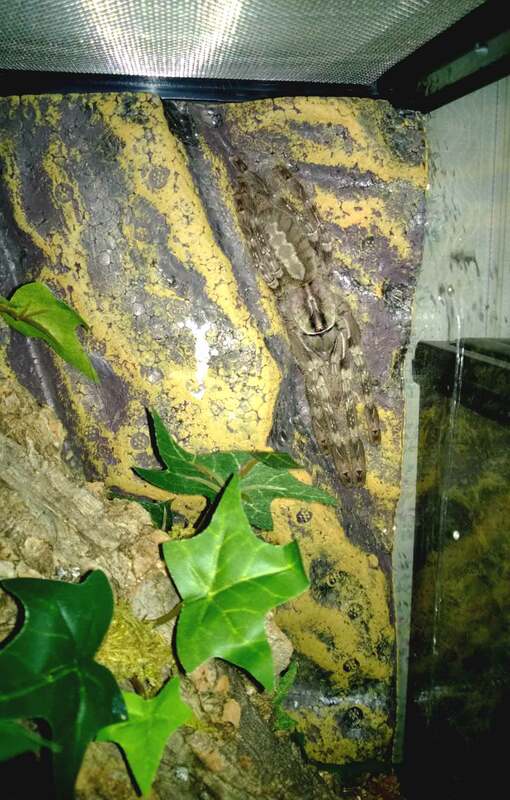 However, having seen how quickly she can move, and understanding that a bite from this species would be VERY unpleasant, I completely recognized why Poecilotheria are considered to be an advanced species. This is not an animal to be trifled with, and it deserves not fear, but a healthy measure of respect and attention.